Vietnam has a bridge that is definitely worth a trip to take a selfie. Upon a 1,864-foot-long bridge, a steel dragon breathes fire as drivers pass under it. Yes, real fire. Watching it shoot fire might seem a bit terrifying for the six lanes of traffic that drive beneath the mythical giant, but it can also playfully spray water from its mouth. 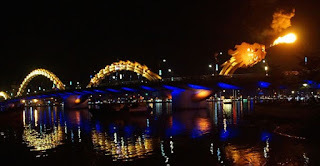 The bridge opened on March 29, 2013 to commemorate the 38th anniversary of the taking of the port city of Da Nang by the North Vietnamese near the end of the Vietnam War. The metallic dragon was modeled on one from the Ly Dynasty and is illuminated with 2,500 LED lights. Street vendors, water buffalos, mopeds buzzing around and floating markets are a visitor’s first experiences when visiting such a naturally rich and cultural destination as Vietnam. From the temples of Hanoi and the islands of Halong Bay to the beaches of Nha Trang and the palaces of Hue, it is a country now firmly etched in the travel psyche. The second largest coffee production destination in the world, Vietnam is ideal for the caffeine addicts. A cashew nut heaven, full of exotic foods and fruits, one may come across a Vietnamese speciality ruou ran, a rice wine with a pickled snake in it that is said to cure all illnesses. Vietnamese food is a blend of Chinese and Thai styles and is considered one of the healthiest cuisines in the world. Explore the cities, explore the people, and discover a whole world of new and old cultures that make Vietnam such an iconic destination to visit.